The following are some examples of particular cognitive apprenticeship activities/tasks. Please note that these are for illustrative purposes and that the actual syllabi and curricula, sequencing, etc. will mostly be determined by participants’ needs and current practices, both proficient practitioners and novices, and the online platforms and tools that are available to them. Method: A group of participants with varying levels of experience and proficiency at this task collaboratively read and make sense of a paper or article. Objectives: For experienced, proficient practitioners to gain a deeper more comprehensive understanding of a paper or article through reading, note taking, questioning, reflecting, sharing views, engaging with each others’ views, and collaboratively interpreting it. For novice practitioners to see and experience what online collaborative reading and sense-making processes and the associated tools look like, how they work, and the methods, approaches, strategies, and techniques used. Novice practitioners watch recordings of previous online collaborative reading and sense-making sessions and reflect on their observations. Some guiding prompts and questions to draw novice practitioners’ attention to important, salient aspects of the sessions may be helpful. Two or more proficient practitioners agree on a paper or article to read. All the practitioners read the paper or article in advance and make notes. They can optionally share their notes before the collaborative online meeting. One practitioner uploads or links to the article to the online learning environment and invites the others to join and synchronous online meeting (Figure 1). More proficient practitioners lead the activity, modelling good practices. They may, where necessary give rationales and/or explicitly bring less proficient practitioners’ attention to particular aspects of the paper or article that they are discussing. Less proficient practitioners observe and participate when they can and/or when they are invited to. Additionally, online chat platforms can provide opportunities for novices to pose questions to the more proficient practitioners in text and without interrupting the flow of the activity. The more proficient practitioners can attend to and respond to novices’ questions at opportune moments. 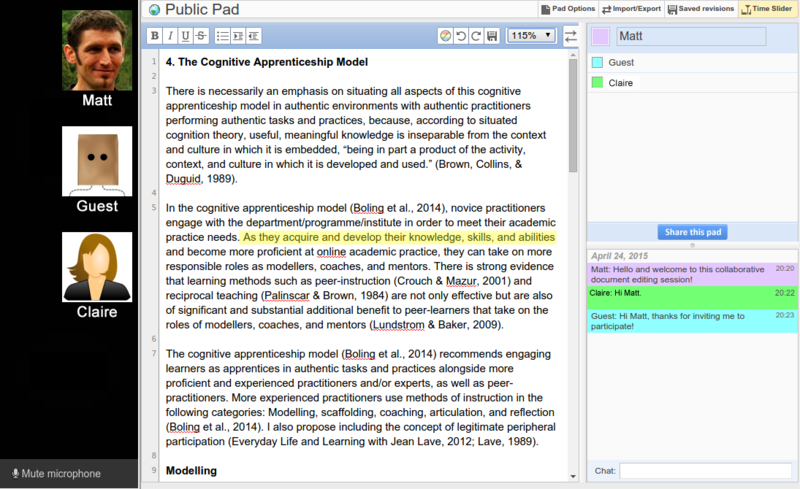 In figure 1, we can see the text of a document imported into an Etherpad instance (real-time collaborative document editing, similar to Google Docs) embedded in the online learning environment, with various tools for communicating and making notes. In the centre is the paper being reviewed. In the left column is a Web Real-Time Communication (WebRTC) application for multi-way audio conversation and in the right column is a chat window for brief text communication. All participants can speak and be heard simultaneously. Practitioners are free to use whichever means of communication and collaborative tools they prefer to meet their immediate learning and collaborating needs. Novice practitioners will be able to observe the various tools in use in context in an authentic collaborative online academic task. They will see how experienced practitioners use the tools, which tools they use and when, in order to achieve specific aims and goals, and how this tool use fits into the online learning environment, including how proficient practitioners interact and collaborate via the tools. Example #2: Working Backwards: Searching for Appropriate Papers and Articles to Review. Following Lave’s presented model of apprenticeship (Everyday Life and Learning with Jean Lave, 2012) where novices work backwards through the tasks of a type of project from finish to start, after novices have mastered many of the processes of collaborative reading and sense-making in example #1, they can then follow and observe how practitioners search for and evaluate potential papers and articles to read. Method: A group of participants with varying levels of experience and proficiency at this task collaboratively search through research literature databases and search engines. Objectives: For experienced practitioners to find and review an article or paper that is relevant to their current area of investigation. For novice practitioners to see and experience what online collaborative research literature searching and the associated tools look like, how it works, and the methods, approaches, strategies, and techniques used. As with example #1, novice practitioners watch recordings of previous online collaborative searching for appropriate papers and articles to review sessions and reflect on their observations. Some guiding prompts and questions to draw novice practitioners’ attention to important, salient aspects of the sessions may be helpful. All practitioners meet in an online audio, video, and screen-sharing web conferencing platform. They negotiate a definition of what they want to find or the particular concepts and topics that they want to address and discuss. They use various tools, databases, and search engines to find potentially suitable articles and papers. They explicitly describe the search terms they use, how they construct their search queries in order to get the results they want, and how they can refine their queries to alter the results they get. When they find potential papers, they model how they skim-read through specific parts of papers and articles to evaluate their suitability and relevance to the agreed concepts and topics they want to address. When they choose a paper or article, they then explicitly show how they use tools to quickly and conveniently store bibliographical data for later use in citations and references in papers they are writing, e.g. using bibliography management software. Novices can be invited to participate in specific aspects of this process according to their levels of experience and proficiency, thereby helping the more experienced practitioners. Novice practitioners should write effective online personal profiles and personal learning networks (PLNs) to enable them to make themselves known to their peers and their online academic communities and to facilitate communication and collaboration for academic practice. Some colleges and universities may provide sufficient, suitable, and adequate tools and platforms for online academic communication, collaboration, and practice, but when such tools and/or platforms are not available via the college or university, practitioners will be greatly helped if they can use the alternatives that are available to them, for example Microsoft Office 360, Microsoft Sharepoint, Microsoft OneDrive, Google Docs, Google Drive, Google Hangouts, Google Plus, Etherpad, WordPress.com, Blogger, Academia.edu, Adobe Connect, MeetingBurner, Skype, and web-based real time communications tools (WebRTC), and organise their own online study groups to support their academic practice. Method: Put a selection of personal academic profiles in rank order from best to worst in order to examine and articulate what makes a “good” profile and PLN. Intervention by a skilled facilitator/counsellor may be necessary or beneficial to some novice practitioners. Objectives: To see what academic profiles and PLNs look like, what they are used for, and what the most salient and important aspects of them are. Ultimately, for novices to be able to write their own profiles and construct their own PLNs appropriately and effectively. A group of 3–5 novice practitioners examine a number of academic profiles and PLNs, for example 7. Individually, they put the profiles and PLNs in rank order from best to worst. They then reflect on why and give their rationales and reasoning for ranking them in that particular order. With their group, they then compare and discuss their rationales and reasoning for their respective rank orders and, if there are differences of opinion, examine those more closely and try to reveal and test their underlying assumptions. Optionally, the novice practitioners can create a shared rubric of criteria for evaluating personal academic profiles and PLNs. They write their own personal academic profiles and construct their PLNs, following their rationales and reasoning for making them as effective and appropriate as they can. They submit their profiles and PLNs to their group and follow steps 2–4 again, this time examining their groups’ profiles and PLNs. They make edits and amendments to their own profiles and PLNs according to the feedback and discussions with their group. Please note that in the three examples given, at no time does any participant take on the role of teacher, instructor, or coach. They are simply groups of practitioners who take on roles in the tasks and activities according to their current knowledge skills and abilities. There may be some opportunities for reciprocal interactions between more and less proficient practitioners. Proficient practitioners can reduce their workload by passing some of their simpler more manageable tasks on to less proficient practitioners, thereby giving less proficient practitioners valuable experience at authentic academic tasks.